What does sandbagging mean in poker? What is the definition of sandbagging in the game of poker? Sandbagging, also know as slow playing, occurs when a player attempts to make it look like his or her cards are weak when they're actually strong. 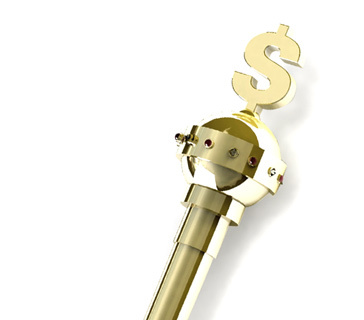 The player does this by either checking or making a small bet in the open, which indicates a weak hand, or smooth calling a raise, which indicates a hand that's possibly weaker than the bettor's. The purpose of sandbagging is to goad opponents into betting more than they would if they believed the sandbagging player had a strong hand. For example, if a player has two aces against a flop with a king, jack, and seven, they might bet weakly as if they had middle or lower pair in the hopes that an opponent with a king will take the bait and raise aggressively. If that did happen, the sandbagging player could continue to slow play the hand by only calling the opponent's raise even though they could reraise with little fear of losing the hand. By sandbagging the hand the player stands to make more than if they bet their aces aggressively and forced everybody else to fold early. Many players sandbag by checking before and right after the flop. A popular variation of this is the check-raise, in which a player checks in the hopes that an opponent bets, then reraises any bet. However, the sandbagging technically only occurs when the player checks because the ruse ends when a reraise is posted. 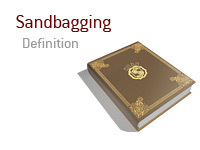 Sandbagging specifically refers to the act of deception in pretending a hand is weaker than it actually is. Betting aggressively ends that deception. As with any poker tactic, sandbagging is best used judiciously. Winning a hand or two with a slow play can tempt players to use the method repeatedly, but doing so hampers its effectiveness.